What are “real-world use cases” of today’s digital-hype technologies? Arthur D. Little’s sixth executive roundtable on “Digitalization” focused on implementation examples of technology-hype topics in different industry contexts, with emphasis on artificial intelligence (AI), robotics process automation (RPA) and blockchain. 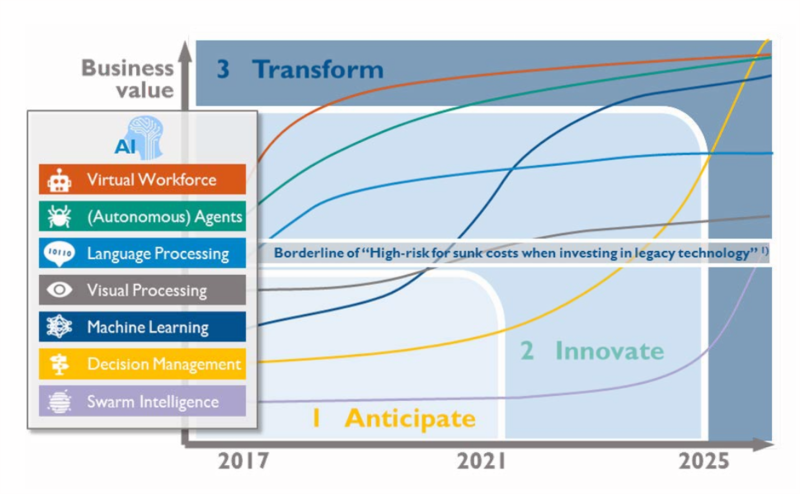 The cross-industry discussions revealed that certain AI and RPA applications have reached “ready-to-use” maturity and are almost standard in some industries, while they are hardly dealt with in others. Blockchain, on the other hand, has disruption potential in almost every imaginable application area – but still needs to be proven in real life outside the financial industry. The sixth Arthur D. Little roundtable on “Digitalization” was introduced by Volker Pfirsching, head of ADL’s Digital Competence Center, with a clear message: It is not too late to benefit from today’s hype topics! Still, as technologies, e.g., in artificial intelligence, are at different maturity levels, some technologies have reached maturity that allows disruption of established technologies – depending on the use cases in which they can be applied. Artificial intelligence, for example, could make many of today’s heavy investments in existing technology and IT obsolete within months, as some forms of it are already about to transform industries. As an example, the group discussed software robots as one specific form of AI: an insurance executive shared his experience with RPA. In his industry the technology is close to becoming established and is, rather, regarded as a bridge technology on the way towards more advanced AI. Representatives from other industries, on the other hand, shared their experiences with ongoing activities that were still in piloting phases and therefore some steps away from becoming standard. With the Internet of Things (IoT) every- where, can regulation be far behind?